Ryerson Student Learning Centre – Bousfields Inc.
Bousfields was retained by Ryerson University to obtain rezoning and site plan approvals for the Ryerson Student Learning Centre. 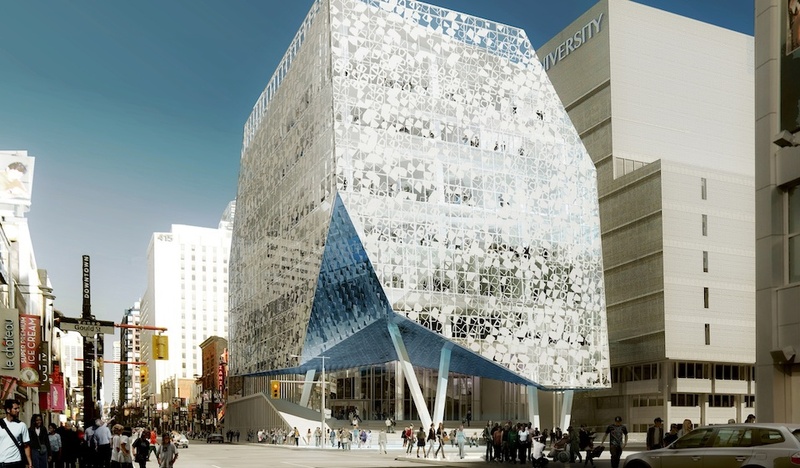 Located at the northeast corner of Yonge Street and Gould Street in downtown Toronto, the student centre is an architecturally striking building that connects Ryerson with Yonge Street via active retail uses at grade and institutional uses above. It replaces the former Sam the Recordman building at an important location along the Yonge Street corridor. The site was an important first step in the development of the City’s Yonge Street corridor planning study and is seen as a catalyst for rejuvenating Yonge Street between Dundas and Gerrard Street. Bousfields prepared a Planning and Urban Design Rationale in support of the proposal as well as provided project management services in seeing the project through to approval. The building was designed by Toronto’s Zeidler Architects as well as Snohetta Archiects from Norway. The City approved the Zoning By-law Amendment in December 2011 and the site plan agreement was executed in May 2012.